Birds and people like similar things; they like color, they like things that shine, and they are curious about finding whatever is ‘new’ in our environment. We attract them to our homes to feed them and watch them because they are beautiful and they give us so much joy. They also drop poison ivy seeds in our yards. Well, we aren’t going to get rid of the birds — and nor would we want to — so what option does that leave us? Well, that leaves us with identifying the poison ivy plants as they grow, and getting rid of them while they are small and manageable. 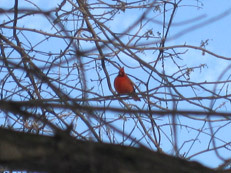 A cardinal sits on a poison ivy plant, contemplating which berry among the many he should eat first. The poison ivy berry is an important food source for over fifty species of overwintering birds. A penny for your thoughts? Pull that sucker while he’s small! 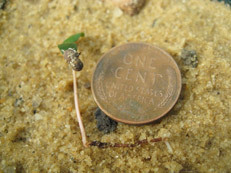 To the left of the penny, a just-germinated poison ivy seedling. 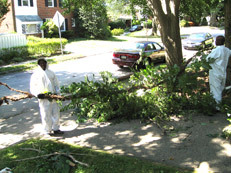 Clients call us to clear a major poison ivy challenge from a hedge of ginkgo trees. Held by two men is a 14 year old, 20 foot long, 80 pound poison ivy vine. Thanks for the helpful post, Umar. Any advice on diy removal, since many folks are allergic to pi? 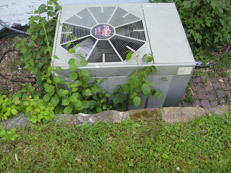 Take a good look at the plant and the situation it grows in, be sure you know what size of plant you are dealing with before getting started. If it’s a seedling from this season, you can tackle it by digging it out with a shovel. If it’s a larger plant then estimate if you would feel comfortable digging it out, dress to cover all skin surfaces and carefully dig out as much as you can comfortably manage.